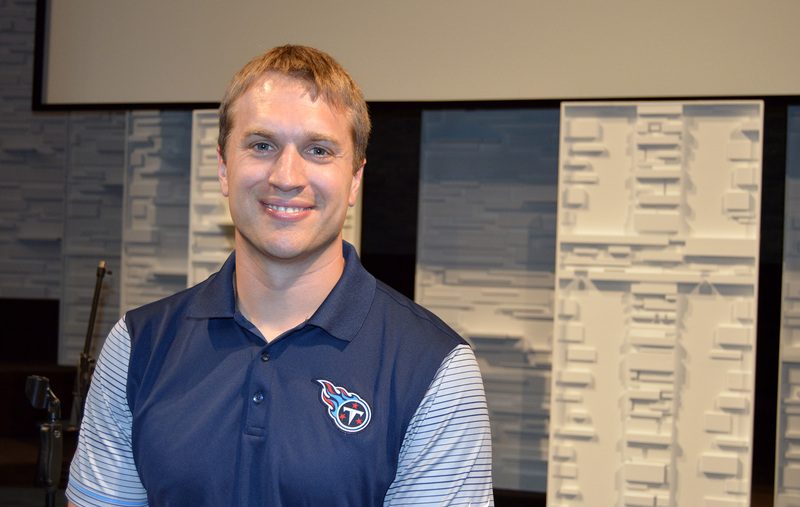 Reverend Casey Cramer ’04 serves as the pastor of children and families at Christ Presbyterian Church in Nashville, TN, and as chaplain of the National Football League’s Tennessee Titans. Before attending Covenant Theological Seminary and becoming chaplain of the Titans, he spent five seasons playing fullback and tight-end for the Tampa Bay Buccaneers, New York Jets, Tennessee Titans, Miami Dolphins, and Carolina Panthers. While at Dartmouth, Cramer lettered in varsity football for four years and served as the captain of the 2003 Big Green team while majoring in psychological and brain sciences. He lives in in Franklin, TN, with his wife Kelsey and their four young children. I believe it was the rigorous academic classes and arduous schedule at Dartmouth that prepared me for the stressful physical and mental demands of the NFL. In high school I was more easily able to maintain high academic standards, but it was in my freshman fall quarter that I learned just how much effort was required to succeed in the Dartmouth classroom. This made me develop my work ethic, because I was forced to work harder to keep up with the lofty standards of my fellow classmates. This same process happened for me again when I arrived in my first NFL training camp. I was no longer able to easily maintain my athletic performance with the high abilities of the professional football players around me and so I needed to dig deeper and face difficulties with more effort and grit. You were well known for being a jack-of-all-trades on the field—and for your intellect, tenacity, and ability to see the bigger picture in outside life, as well. Not many players are so well rounded. How do you stay focused while still being flexible enough to handle whatever comes your way? It is often said that NFL stands for “Not For Long.” The average length of an NFL career is three years and although I played longer than average, I knew my time in football was limited. I saw playing as a way to springboard into my next career after football because—let’s be honest—28 is just too young to retire! I attempted to be well rounded because a player with average talent can make a career in the NFL if he does all the little things right, makes no mistakes, and finds a way to separate himself from others. I find this talent to be transferable to the corporate and ministry world, so I used the platform of the NFL to network, explore vocations, and find ways to positively influence my surroundings. The statistic for retired NFL players is that two years after retiring from the NFL 80 percent of players are bankrupt, unemployed, or divorced. I also did not want to be another statistic. You made a big career change from being a player to being a chaplain and pastor. What brought on the change, and do those positions have anything in common? Every off-season I took the opportunity to prepare for the next phase of life after football. I had an internship on a bond trading floor, passed the Series 7 to sell and trade securities, did a wealth-management internship, participated in executive education courses at Stanford, Kellogg, Wharton, and Harvard business schools, and took the GMAT to prepare for doing an MBA. But after all these achievements, I learned that all the personal success and accolades I had received on and off the playing field did not satisfy me. I had received, in my opinion, all that I could have ever wanted from the world, but yet still felt like it was not enough. Don’t get me wrong, a successful career in finance can make a huge impact in the world and I have seen many men and women do amazing work in this field. For some reason, though, I knew it wasn’t for me. Instead, it was when a teammate of mine introduced a more promising alternative for me personally that I took the time to explore my faith. The more I read scripture and the more I studied theology, the more hopeful I became. Now as a I pastor, I thoroughly enjoy pouring into the lives of NFL players, coaches, and their families, and helping them see the hope that I so desperately needed as well. What helps me in my career now is that I have learned through playing in the NFL that it is not about me or what I can do, but about who has already done it all for me. And for this knowledge, I am eternally thankful.